Shenzhen Bailuo Technology Co. Lt, owner of Viparspectra, has been calling the shots for indoor gardening operations since 2013 with their superior lights. 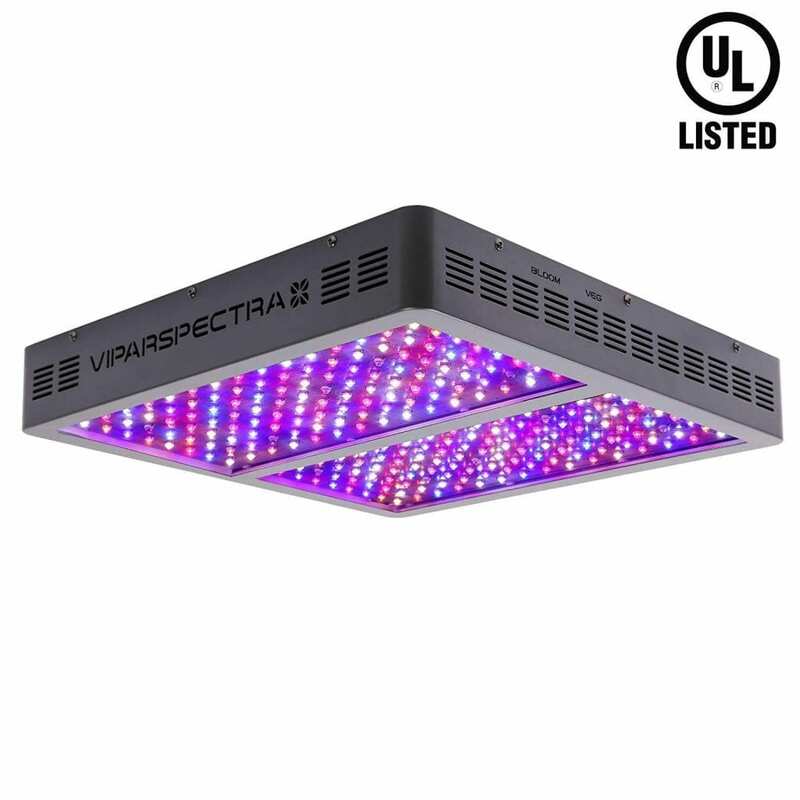 Particularly, this Viparspectra 1200W LED grow light is a good addition for your indoor cannabis garden. It is ideal for your plants to be bountiful and healthy by maintaining an encouraging, synergetic equilibrium between Coverage and PAR Output. From the moment of vegetative conception, till blissful blooming, medical plants, organic herbs, orchids and the like are all well nurtured. 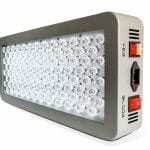 This light is included in the list of best 1200 watt LED grow lights. Read the full list here. Viparspectra has highlighted their design to cater to avid cannabis gardeners, who want to capitalize on reducing overall operating costs. The effectiveness of the Viparspectra 1200w also increases revenues for every square foot by producing back-to-back premium consistency. The company offers a 3-year warranty and a 30-day return guarantee. The Viparspectra LED grow light comes alongside an instruction manual, hanging kit, 2 adjustable YOYO rope hangers, and a 6ft heavy-duty power cord. Viparspectra has gone all out with this upgraded version, instilling within in a full-spectrum layout, upgraded aluminum cooling heat sinks, and reflector design. Thus, leaving no stone unturned, this black, 20lb, 19.4”x19.4”x3 inch device boasts UL Certified components that ensure 100,000 hours of functioning capabilities. 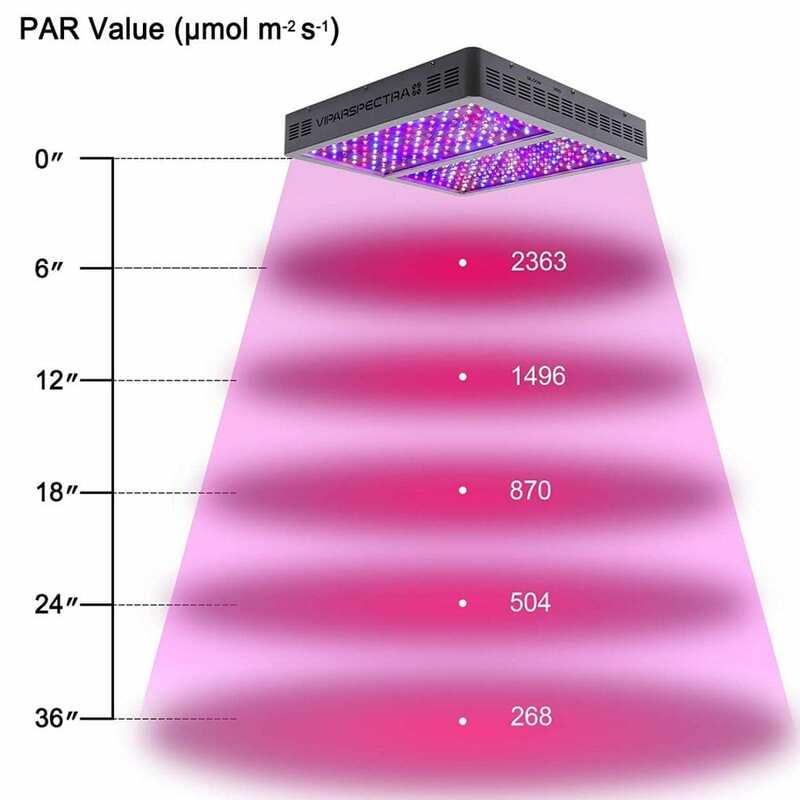 The 1200 watt LED grow light includes 240pcs red, blue and white LED Bulbs with 90 degrees optics. It contains high-intensity 5W Epilied/ Bridgelux LED dimmable diodes. 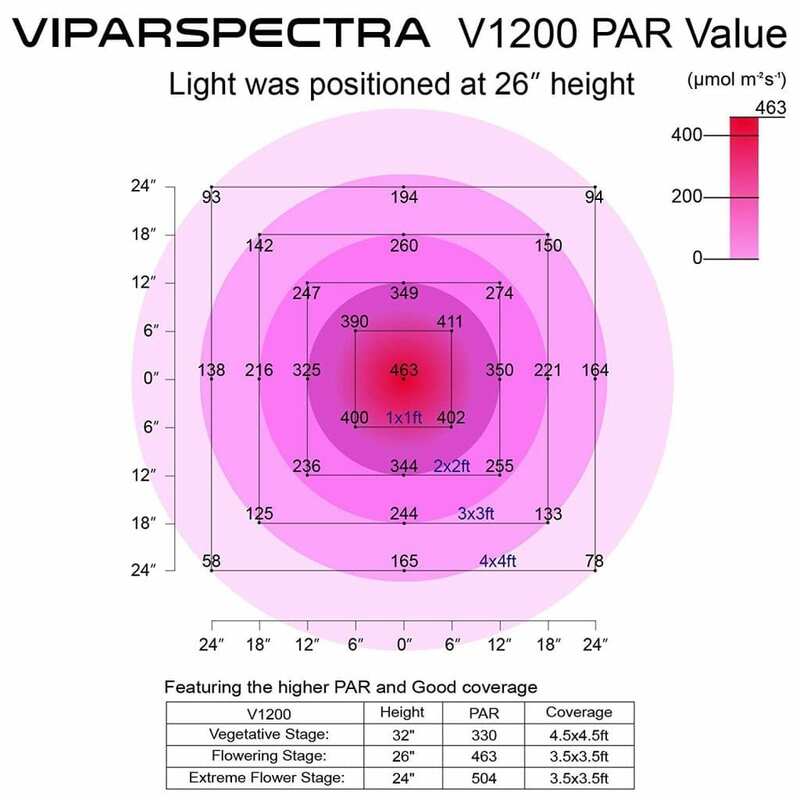 The Viparspectra 1200w replaces a 1000w HPS/MH light whilst having an average power draw of only 520 watts. It is the perfect light for your 4×4 grow tent. Cannabis and plants as living organisms thrive depending on how well their treatment is at each stage of development. The Viparspectra 1200w caters to these highly specific demands by bringing a Veg and Bloom switch feature. The range of the spectrum provided covers Infrared, 660nm, 580nm, 615nm, 730nm, 475nm, 595nm, 630nm, 460nm, 440nm, 445nm, 7500K and 3000K. 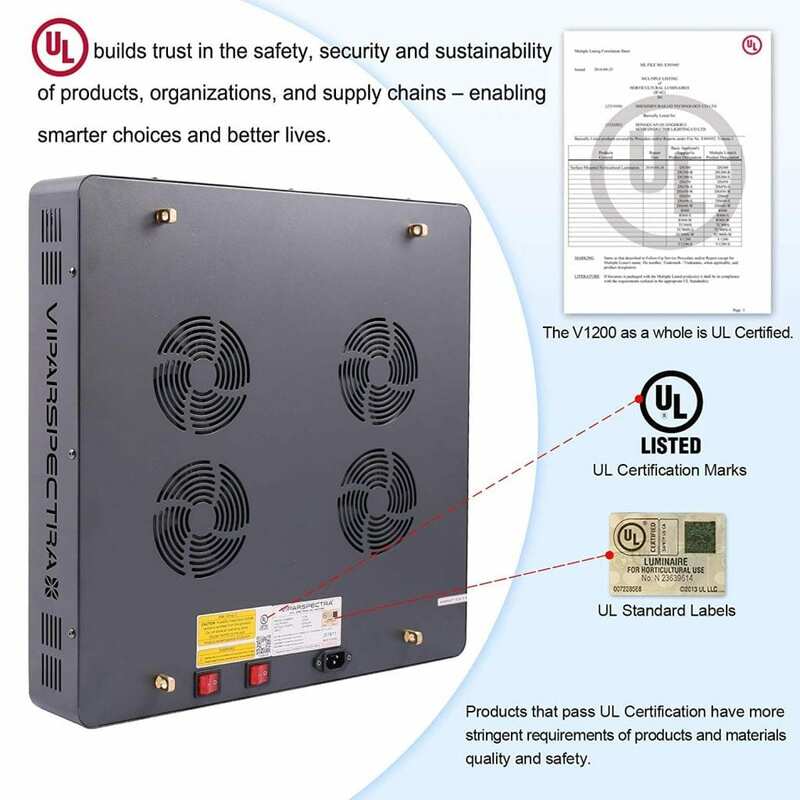 It also operates at a frequency of 50-60Hz and its input voltage is 100-265V. Armed to minimize heat dissipation at any cost, the 4.72” inch fans and 0.8” high heat sinks effectively and silently prevent overheating. Hanging it at 24” allows optimal coverage of 3.5×3.5 feet and 4×4 feet regions. Increasing the altitude will stretch out to even cover a 5×5 feet area. But this is not at its optimal hanging height. This full-cycle top-lighting solution satisfies large growing spaces with PPFD up to 870umol/m2/s at 18” above the canopy. At 24” you gain 508umols PAR value and from 18” 750 lumens. This video covers all the important features of the Viparspectra 1200w in short. Light distribution amidst LED lights immaculately proportionate, dispersing equal lighting over plants. 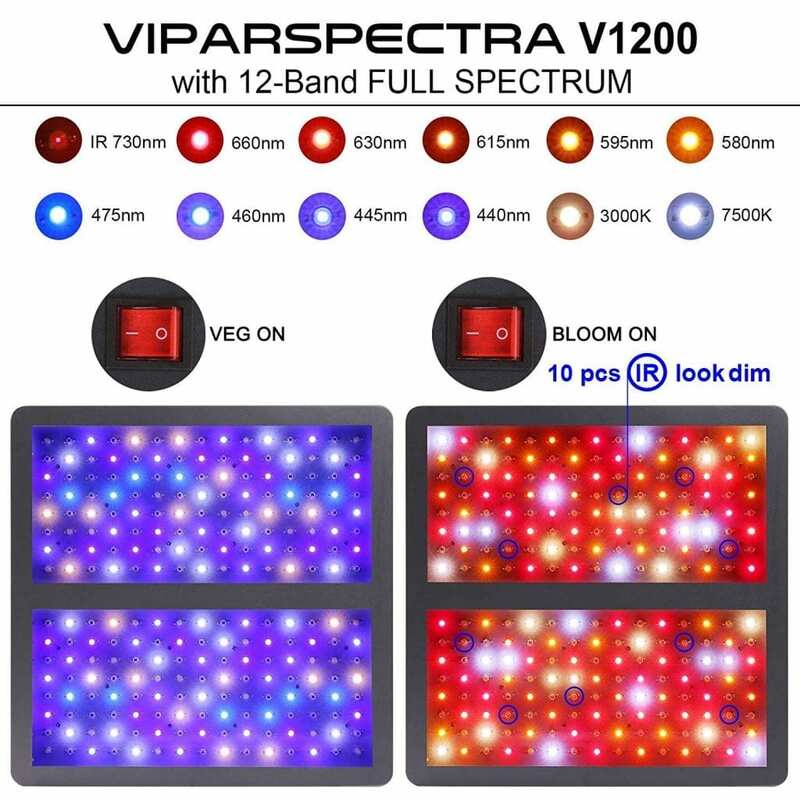 For enthusiasts looking to getting an ideal yield with a budget-friendly led grow light, the Viparspectra 1200W V1200 LED grow light is the model to procure. The benefits it brings to the table far exceed the few drawbacks presented. Not only does it deliver a hundred percent on performance, it also guarantees a low breakdown rate, high yields, and reduced overall costs. The multifaceted functionalities provide a high level of control and powerful light output. This makes it a good indoor LED light for growing operations. Interested in other lights of this series? Check out the Viparspectra 300w, 600w and 900w. Are you interested in the best grow tools? Check out this page. Do you need a grow tent to grow your plants? We reviewed various sizes and options. You can find them on this page.